Through to 2023 and beyond. NBN Co has laid out a detailed roadmap and timeline of options to upgrade almost all last-mile access technologies barring fibre-to-the-node and satellite over the next five years. 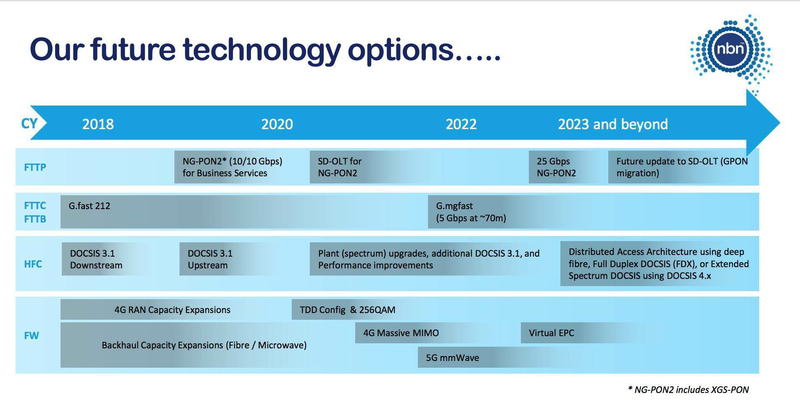 The roadmap shows where NBN Co’s chief technology office’s thinking is around different upgrade paths, both immediately and for “2023 and beyond”. Given the network is meant to be built - and potentially sold - before the roadmap expires, it provides a glimpse of how the NBN could evolve beyond its anticipated completion in 2020. For that reason, the roadmap is not presented as a definitive evolutionary path for the network, but rather a series of directions that it could move in. NBN Co’s CTO office is known to be the internal home of its research and experimentation efforts, including previously disclosed - and implemented - shifts into areas such as the internet of things. Some of what is listed for 2018 on the roadmap is already being worked on. For example, immediate work on FTTC/B is listed as “G.Fast 212”, a technology that NBN Co said last year it would be using in parts of its network, beginning most likely with business users. NBN Co, however, suggests that it could turn to G.mgfast in around 2022, which could enable multi gigabit speeds on this part of the network. For its fibre-to-the-premises (FTTP) network, the roadmap suggest 10Gbps symmetric services for business around 2019 using NG-PON2 technology, which NBN Co and Nokia trialled in the lab last year. The application of NG-PON2 to end user connections is a useful development, given the trials indicated the technology was destined for backhaul use only, though business connection use was also possible. Beyond 2020, NBN Co indicates a possible upgrade to SD-OLTs - software-defined optical line terminals - for NG-PON2. OLTs are the terminal equipment used to provide the GPON signals to each of the fibre distribution areas. NBN Co suggests that it could enable 25Gbps symmetrical FTTP speeds using NG-PON2 by about 2023. For the hybrid fibre coaxial (HFC) network, much of the future work revolves around DOCSIS 3.1 adoption, which NBN Co has already committed to. The upgrade options for 2023 and beyond are currently pitched around distributed access architectures (DAAs), which network equipment makers spent much of last year hyping as a way to resolve future capacity restraints and improve HFC plant efficiency. Other options include full-duplex DOCSIS - which NBN Co is known to be considering trials of - and extended spectrum DOCSIS. Finally, on the fixed wireless front, the immediate options to increase capacity are 4G radio access network capacity expansions, as well as upgrades to microwave or fibre backhaul that service LTE sites. However, there will be considerable interest in the future options being considered for fixed wireless. One option on the table is 4G massive MIMO and 256QAM technologies, which are being deployed by commercial LTE carriers like Telstra to boost the performance of some sites to multi-gigabit peak speeds. Also of particular interest is that NBN Co includes 5G plans only in the millimetre wave bands rather than in the highly-prized 3.5GHz spectrum it currently has rights over. That 3.5GHz spectrum has been targeted in a long campaign by Vodafone to have it re-auctioned. The absence of plans for 5G services in this band suggest NBN Co is likely to approach 5G in a different manner than first thought. The only technology not covered by NBN Co's disclosure is satellite. A third satellite has been mooted on-and-off for some time, but NBN Co has not committed to the plan.